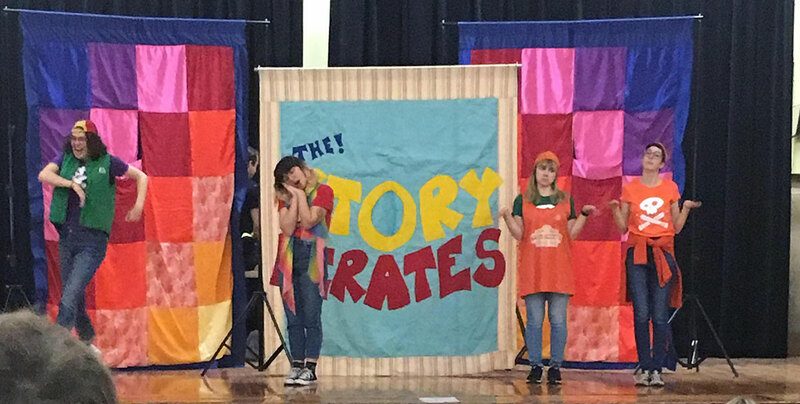 Seth Boyden welcomed The Story Pirates for two assemblies (one for K-2, one for 3-5) on Tuesday. This group turns kids’ original stories into wild sketch comedy musicals featuring professional actors. The show was great fun; it featured stories written by kids from all over the tri-state area, with enough variety for everyone to enjoy. The students seemed to especially like the part where the cast took suggestions from the audience and acted out a brand-new story, “written” by Seth Boyden students. The PTA has donated six copies of the Story Pirates’ first book, “Stuck in the Stone Age,” to the Seth Boyden library. If your child wants to submit a story to the Story Pirates, s/he can do it through storypirates.com. The group also has a kids’ podcast available through Apple podcasts or Spotify.